Ghost once again bounces from set to set. After being the second set opener in Lakewood, Ghost moves to the beginning of the first set in Holmdel. No segues have been included. Some loops start to echo with Mike and Fish come marching through pretty early. A smaller gap between Trey’s loops and the Mike/Fish entrance than we have seen. The pace starts out nice and slow, while very controlled. Nothing too crazy, just a nice easy groove. When the vocals enter, they do so with ease. The solo section has Page walking around his rig with some swank. Other than that? Extremely bland. The pause is really short, and the drop in is pretty average (which is not good). The jam becomes minimalist right away. Other than some big notes from Mike, and a steady beat from Fish, not much is going on. I like this approach instead of moving right into the sectioned off jamming, this era sees so often. This minimalist jam settles in nicely. I love moving and dancing to this type of jamming. At 5:43, Trey is repeating a lick and Mike answers with some crazy bass notes. His notes seem to bounce directly from the bass to my ears. It almost sounds like he is on a pogo stick that would be in “Tron”. Boing, Boing! Starting at the 6:30 mark, Fish pushes the tempo and the Cactus pogo-stick is moving much quicker. Trey takes a while to come along but eventually picks it up. The jam builds nicely. Things get quicker and louder. Mike’s bass line becomes more prevalent as each measure passes. At about 7:50, he changes things up and the jam turns. Trey rings out some loud notes that blow out my ear drums. The jam then settles back into the build groove. The big change is that now Trey is soloing. After he solos for a couple of notes, the rest of the band starts to stray with him. Fish uses a variety of different beats while Page holds down the jam in my opinion. Mike’s bass is moving quickly, and he finds a great spot in this section. 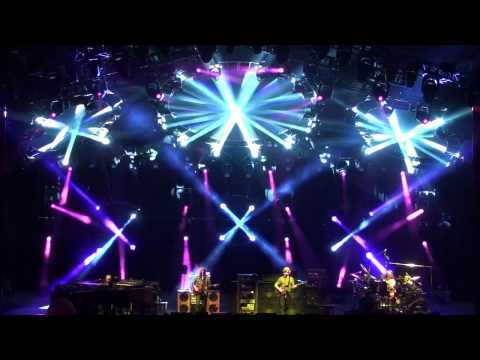 At around 9:35, Trey really finds himself and lets a couple of beautiful notes go. He takes it up even further at 9:52, and plays a couple of awesome notes. Fishman is grooving right underneath him. At 10:15 Fish kicks into hyper-drive and really starts to push things. Wow is he ever moving! The band doesn’t move with him right away however. At 10:43, Fish begins pushing even harder! Trey fights him a bit and plays some spaced out lingering notes that ring out. At 10:56, it sounds like Trey has given in and is going to really pick things up. Mike starts to follow Fish and plays a quick bass line. Trey thinks the better of it, and moves away from Fish, going towards a more minimalist style. This section is extremely interesting to see the battle for tempo between Trey and Fish. Fish really pushes things multiple times, while Trey seems to counter him and want to space things out. It took me a couple of listens to really grasp that, but it is an interesting dynamic to this jam. Trey starts to move with Fish finally and starts to play an awesome lick. The crowd responds and it seems like they could go into “Llama” at any second (Credit @caravan2001). In fact I wish they would have! That would have been perfect. At 13:00, Page plays some slowed down piano chords adding great texture to this jam. At around 13:15 the jam sounds like it might break down again. Trey then lets out another insanely loud note. While that note provides some feedback, he starts to get into it around the 13:53 mark. Around the 14:15 mark, the jam moves into high gear and Mike is just going crazy. Then at 14:30, he cranks out an insane sound. He drops the dirty scary bass right in the middle of this rager. A+ move by Mike. The crowd responds enthusiastically. The jam then picks back up for a bit before moving to a fade out. Some cool evil sounds from Trey and Mike bring this Ghost to a close. This is not my favorite Ghost. It has some interesting parts, but it doesn’t find the magic we see in this era. Fish and Trey move against each other quite a bit, and I never feel like the band is completely locked in. It has some great potential but never really got there.